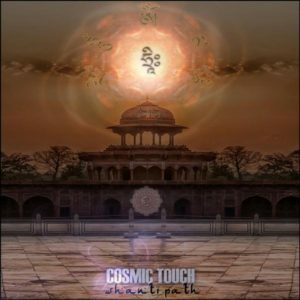 Following a string of well-received releases in 2016, Finnish producer Cosmic Touch (Nico Kumpulainen) presents Shanti Path, a sonic expedition into the world of sacred mantras fused with glitchy psychedelic bass music. Eastern vibes and wobbly bass lines fuse to provide the spiritual setting for this journey into the heart. Mastered by Astropilot with artwork by Martin Hawk. MP3 Download | FLAC Download | WAV Download · Download count: 8,522. Yes, this release is maybe a little bit hard to digest, but I think it deserves more than 80%. To say at least it’s very interesting, conceptual and kind of unique. Eastern vibes and glitchy bass lines? Sounds better in theory than it is in reality. Whoa these tunes really spoke to my soul in a universal level. After too many dark spy!! Shanti Path is new breath! Really!! Strange album, i notice higher volume level as standard. Very cool release. The mix is loud and should have been reduced in volume before mastering, or mastered at a lower dB level. As is, it is an incredibly entertaining release and well done, except it loses a lot of dynamism due to the volume level, like many channels/instruments are struggling to be heard, because the others are too loud. Heck I would love to take the original track in a DAW and re-do the final stage of the mix, because this release is so damn awesome. The big cat roar at the beginning of Hall of the Lionhead perks me right up! The mastering hurts my ears. The compositions are nicely complex but I find the tone cheesy as well. Too many familiar ‘Eastern’ stock vocal samples. I do like some of the wobbles. This album is projection pain and abstinence in siromystic and finaly shoot from this world and arrive to actual world.